Though we like to think that we know what we should or should not do, there are times when our good judgement fails us. We make poor choices, and as a result, we get into unfortunate situations. In today's picture book, you will meet a pair of sheep who consistently make bad decisions, and you will also meet a sheep dog who is regularly forced to save them from themselves. Rocky and Blossom are a pair of sheep who live in a mountain meadow along with one hundred and forty-seven other sheep and a sheep dog. The dog is called Murphy, and he knows all to well that Rocky and Blossom are a pair of troublemakers. Therefore, when the two sheep tell Murphy that they want to go to the high meadow on the mountain, he informs them that they need to stay where they are. Murphy knows that the mountain is a place that is full of dangers. Not surprisingly, considering their track record of making “bad decisions,” Rocky and Blossom do not listen to Murphy, and as soon as they get the opportunity, they sneak off. Murphy catches up with them and brings them home. Every time they sneak off, the dog finds them. Then, one day, the two naughty sheep finally manage to give Murphy the slip, and they find out for themselves that it really is not wise to ignore the advice of a sensible sheepdog. Many of us like to think that we know what is best for us, and we resent it when someone tells us that something that we really want to do is a bad idea. After all, what do they know? 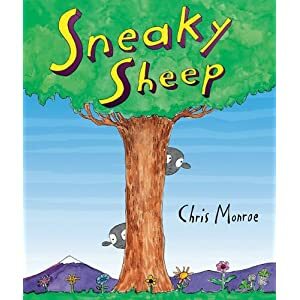 In this laugh-out-loud funny picture book, Chris Monroe uses his sheep characters to show to great effect what can happen when we don’t listen to words of caution. Children will love to see the predicaments the sheep get themselves into, and they will enjoy looking at the interesting formats used in the story that include frames and speech bubbles. I was lucky enough to grow up with a wonderful sheepdog called Balloo. Her mother was a working dog, so Balloo had very strong instincts to take care of baby animals, including me. When I was around two or three, my parents got a Siamese kitten, and they named him T.S. T.S. was not a strong kitten, and soon after he arrived Balloo adopted him. She washed him and he would sleep curled up against her side. Even when T.S. was a large middle aged cat, he would go to Balloo when he was upset or sick, and she would care for him. T.S did not care that Balloo was a dog. As far as he was concerned she was his mother. Seeing the love between the very large fluffy white dog and the skinny Siamese cat made me realize early on that love and family connections can cross all kinds of boundaries. Today's book is about another pair of animals that create a family, despite the fact that they are nothing alike. Mr. Goose asks the chickens if one of them would give him one of their eggs, and they make it clear that they are not interested in helping out a poor goose like him. Then Daisy the dog finds a very large egg, and she gives it to Mr. Goose, who faithfully sits on it to keep it warm. Then one day the eggs cracks and the most peculiar little chick hatches out. Instead of a beak and feathers, this chick has shiny scales and a long tail. It is a rather strange little goose, but Mr. Goose does not care. The baby calls him “Daddy” and Mr. Goose sets about caring for his offspring with love and tender care. Then one day the rooster tells the little green goose and he is not a goose at all, and that Mr. Goose cannot possibly be his daddy. The poor little green goose is distraught, and he sets off to find his real daddy. Families come in all shapes and sizes. Sometimes parents and their children look nothing alike, but the love that connects them is a bond that cannot and should not be broken. In this charming picture book, Adele Sansone shows to great effect how love is what makes a family, not a blood tie, or even a species tie. Anke Faust’s delightful multimedia artwork perfectly compliments the heartwarming story. I have recently been shown, once again, how precious true friends are. They are there in good times and bad, and they help make those scary moments in life a little less scary. I know for a fact that I would climb mountains for these people if I needed to. In today's picture book, you will meet four lawn ornaments who find the courage to do something very frightening so that they can be reunited with the little girl who is their dearest friend. Having read this book, and I will never look at a lawn ornament the same way again. Pearl is a little girl who is best friends with the lawn ornaments who live in the yard in front of her house. One day Pearl tells Betty the deer, Flo the flamingo, Norm the garden gnome, and Jack the jockey that she and her family are moving to a new house. Pearl is excited, but the garden ornaments are not so sure because they have “never left the lawn before,” but they love Pearl and want to be with her no matter what. On moving day, the car is loaded up and Pearl and her family drive away. Without the lawn ornaments. Betty, Flo, Jack, and Norm are appalled. What is going to happen to them? If they stay put, they might end up on the curb and everyone knows what happens if you are put on the curb. A garbage truck takes you away and you are never seen again. Determined to find Pearl, and to avoid garbage trucks, the lawn ornaments set off. They have a map to guide them, but they have a long way to go, and who knows what they are going to have to deal with on their journey. In this heartwarming book, Dan Yaccarino uses his very unique cast of characters to explore what it means to truly value friendship. The lawn ornaments are not ideally suited to travelling across long distances, but they don’t give up, and we cannot help admiring them for their courage and determination. Most of us like to think that we are fair people. When we see someone living on the street we try not to assume the worst about that person. When we see someone who looks different in some way, we try not to place a label on them. We try, but we do not always succeed, and sometimes we make assumptions that we shouldn't make about the people around us. Today's picture book shows to great effect how dangerous it is to make assumptions on this kind. Meena is a large woman who lives on Fly Street, and the children who live on that street are terrified of her. 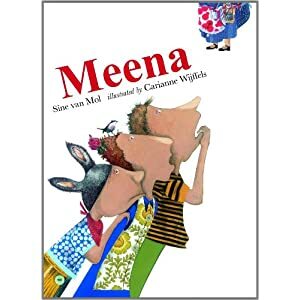 They have decided that Meena is a witch who is dangerous, and when they see that a little girl is visiting Meena, they get into a panic. Meena has taken a prisoner! Wanting to do something for the little girl, Christa, Klaas, and Thomas write WITCH on the street, and they also draw an arrow that points to Meena’s house. Their hope is that once everyone knows what Meena is, the old lady will move away. One day the little girl who visits Meena reads the words on the street. Christa, Klaas, and Thomas talk to her and find out that her name is Anna. They are appalled when Anna explains that Meena is her grandmother. They are convinced that Meena has put a spell on Anna. Anna is equally appalled (and angry) when the three children refuse to believe that Meena is a not a witch. Even when we are being very careful, many of us judge people without knowing anything about them. Something about their appearance or behavior makes us decide that they are weird, creepy, dorky, geeky, or uncool. In this picture book, Sine van Mol and Carianne Wijffels address this issue head on, showing to great effect how hurtful and cruel snap judgments can be. Children will see for themselves that Christa, Klaas, and Thomas are persecuting Meena, even though they have never actually met her or talked to her. Most of us have had to deal with a visitor or a house guest who likes to boss everyone around. They criticize the food, table arrangements, or decor, and then proceed to do things "properly" their way. If the guest is a child, he or she rearranges all the stuffed animals, takes apart the Lego city, reorganizes the tree house, or insists on hosting the doll tea party. There is no stopping people like this because they just don't get it that their interference is unwanted. Today's picture book will resonate with everyone who has suffered at the hands of a bossy person like this. Wally the rabbit is out in his garden counting the carrots, when his friend Mae brings him a letter. Wally is dismayed when he reads the letter and learns that his Uncle Rabbit is coming to visit that very day. He and Mae are going to have to hurry up if they hope to have the house neat and tidy in time. 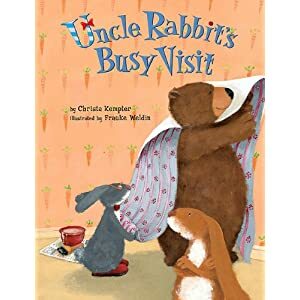 When Uncle Rabbit arrives, he quickly makes friends with Mae, who is delighted to have someone new around to talk to. He just as quickly sets about giving Wally’s house a makeover. He makes new curtains and cushions, moves furniture around, and puts a weather vane on the roof of Wally’s house. Mae thinks that Uncle Rabbit is delightful, but poor Wally feels left out, and he also resents the way in which Uncle Rabbit is changing everything without consulting him. What is poor Wally to do? As they read this story, children are going to fall in love with Wally and his large bear friend. Who can resist Mae with her sticky honey-covered paws, and her rabbit friend who just wants things to stay the same. With sensitivity and humor, Christa Kempter and Frauke Weldin take a look at what it feels like to be bossed around and ignored. Children will appreciate that Wally has been put in a difficult position, and they will surely sympathize with him. When I was growing up, I was not allowed to read comics. Unless they were in Greek or French because they helped me "to develop my reading skills" in those languages. This does not mean that I didn't read comics. I did. I just had to do so on the sly. Thankfully there are now hundreds of fantastic comics/graphic novels being published that are not only beautifully drawn, but that are wonderfully written as well. These are books even my book snob of a father would have approved of! 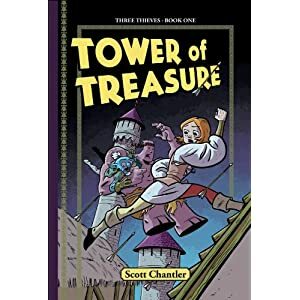 For today's review I have the first title in a series of graphic novels that are about three very different individuals who share adventures. Though they don't always agree on things, when it matters, they help each other out. When Dessa was just a little girl, a tall man with a dark beard came and visited the home that she shared with her mother and twin brother. Dessa and her twin were hiding under the floor, but when the man threatened their mother, Dessa’s brother told her to run and that he would “take care of it.” To this day Dessa has no idea what happened to her brother, but she does know that her mother died when their home was set on fire that night. Now Dessa is part of a travelling circus. She performs as an acrobat, and she is very good at what she does, but her life is hard and she does not particularly enjoy being browbeaten by her boss, Hugo. When the circus gets to Kingsbridge, Hugo is hopeful that they will make lots of money in the big town. While she is performing, Dessa sees someone who looks like the tall man with the beard who destroyed her family. Unable to contain her fury, Dessa accosts the man, only to find out that she has made a mistake. Hugo is furious with Dessa and her friends Fisk and Topper for wrecking the show, and he demands that they either find money or food. He never imagines that Topper is going to try to rob the Queen’s treasury, or that Dessa is actually going to meet the man who killed her mother and kidnapped her brother. This is the first book in what promises to be a thrilling graphic novel series. The tale is packed with colorful characters, and there are plenty of action scenes throughout the story. In addition, we are given clues in this first book about who Dessa’s enemy is, and we can look forward to following Dessa’s adventures as she pursues this enemy and tries to find her brother. When I was a child, I loved going to museums. On the island of Cyprus, where I grew up, the museum is arranged in such a way so that visitors can take a chronological journey through Cyprus' history. Then my parents took me to the British Museum in London, and I happily spent hours admiring mummies, dinosaurs and other wonders. I could not believe how huge the place was, and how much there was to see. Today's poetry title looks at a few of the amazing things that children can experience when they go to a museum. Museums are extraordinary places; they are places that allow us to travel into the past and to better understand what the world was like long ago. For children, museums are also places where they can learn so much without having to be in a classroom. Another group of children discover that the tapestries on display in a museum give them a picture of the past. Carefully created by people who are long gone, the tapestries show “Tales of chivalry, cruelty, battles” and other scenes that connect the viewer with long ago human stories and experiences. This splendid collection serves as a fitting tribute to the museums whose displays delight the eye, challenge the mind, and tickle ones curiosity. 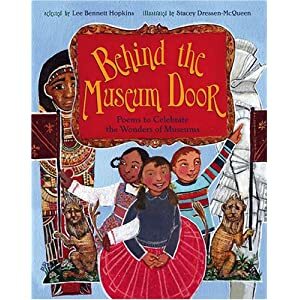 On these pages poems written by Jane Yolen, J. Patrick Lewis, Marilyn Singer and others give young readers a delicious taste of what awaits them behind museum doors. 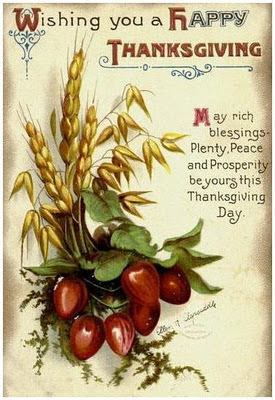 Today people all over America (and Americans in other parts of the world) will spend the day cooking, eating, and recovering for their overeating. For many of these people, the piece de resistance of the meal will be a roasted turkey. The turkeys that Americans eat during Thanksgiving are domesticated birds, but there are still many of their wild cousins roaming around. In fact, I saw a large troop of them just the other day, walking across the road so that they could visit one of the local parks. It seems appropriate somehow to share a book about turkeys with you on this special day. I have often watched my cats and dogs going around the house checking out the sofa, the chair, inside the closet, in a drawer, in a basket. It is only when they finally settle down somewhere that it becomes apparent that they were looking for the right place to have a nap. Finding just the right place to snooze is very important, as you will discover when you read this lovely picture book. It is fall, and the little gray squirrel has been busy collecting nuts and seeds for the winter. He has been so busy that he hasn’t noticed that night is falling. It is getting cold and dark, and he needs to find a warm snug place to spend the night. The squirrel goes to a fallen tree that has a den under it, but the den is full. A big bear is sleeping in it. The little cave under a pile of rocks is also occupied. A fox is asleep inside the cave, and the squirrel does not to wake up a fox who might be feeling hungry. With beautiful illustrations and a lyrical text that is touched with splashes of humor, this delightful picture book takes young readers on a journey around the countryside. Children will enjoy seeing the animals that the squirrel encounters, and they will like trying to guess where the squirrel is going to end up. Young dogs have one thing in common. They are bundles of energy, and very often that energy manifests itself in ways that are less than desirable. One of my dogs decided that chewing the heads off sprinklers was a nice way to pass the time. Another loved to dig up my newly planted flowers or shrubs. There is no doubt that these behaviors drove me crazy, but would I want to have a dog-free - and dog trouble free - life. NEVER! Not long ago Katie and her family adopted two dogs from the Rescue Center. Rosy is very large, soft, and “endlessly patient.” Dave is still a pup, and he is full of energy and unfortunately he does not have any manners. He damages flower beds, steals cupcakes, and tears holes in tights. In short, he is rather out of control. 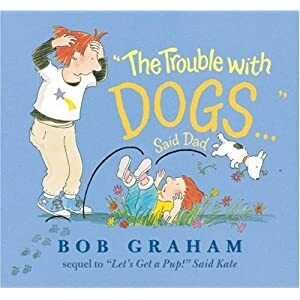 Katie’s parents decide that they need to get some help, so they call a dog trainer, and the very next day the Brigadier from Pup Breakers arrives. In no time at all he has Dave doing exactly what he is told. Katie and her parents should be happy by the development. But they aren’t. Most dog owners soon realize that their dogs own them and not the other way around. Dogs, even when they are doing what we tell them to do, are the ones who have the upper hand. This delightful and heartwarming picture book explores the idea that there really is nothing wrong with being owned by a dog. In fact, it can be both wonderful and rewarding. This book is a sequel to “Let’s get a Pup!” Said Kate. This summer I made friends with a wonderful lady. I treasure our friendship, and we have a splendid time when we get together. The funny thing is that in many ways we are not alike, and no doubt some people are surprised that we are friends at all. I cannot really explain it, but for some reason, our differences don't seem to matter, just like they don't for the two characters in today's picture book. Bella lives in a neat little brick house at the base of tree, and every day she sits at her desk beneath a window and she writes poetry. Writing poetry is what she loves to do, and when her friend Bean turns up and starts to talk about her new hat, Bella is not amused. 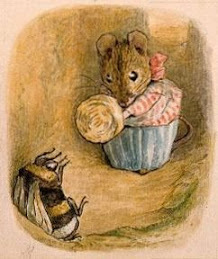 How can a mouse focus on creating poetry when someone is talking to her about hats? Bella makes it clear that she wants to be left alone to work on her poems. After Bean leaves to walk down to Spoon Pond, Bella come up with some wonderful words, and she writes a poem. She is not left in peace for long before Bean is once again standing outside her window. This time Bean shows Bella her toes. Bean says that someone has told her that she has the “cutest toes.” Bella is not interested in Beans toes, and Bean soon leaves. Bella is working on yet another poem, when Bean comes over and she is carrying “something big and green.” Bean invites Bella to come to Spoon Pond to help her plant her snow bush. Bella declines and she shuts her window. She has poems to write, and she has no time to talk about hats, admire toes, or plant snow bushes. Or maybe she does. 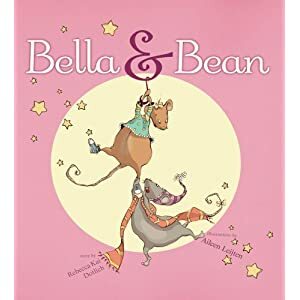 When readers meet Bella and Bean they will think that these two very different mice cannot possibly be friends because they are so very unalike. The funny thing is that they would be wrong. With a delightful text that is sprinkled with poems, and cunning illustrations, the author and illustrator show readers how people (or mice) who are very different can still be friends. They can share the things they love to do and find a common ground that allows them to have a close and meaningful relationship. I have often wondered what my pets do when I am not at home. I imagine that they sleep for much of the time, and sometimes I come home to find clear indications that badness has been going on. A loaf of bread has been nibbled on, a glass has been knocked over, or some furry person has been chewing on the houseplants again. What else do they do that I do not know about though? I know more badness is going on behind my back, but I need evidence! 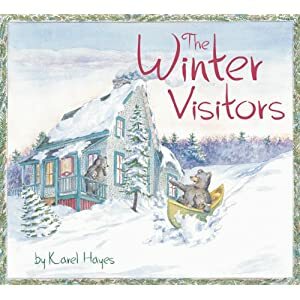 In today's picture book you will find out what happens when a family of humans leave their summer cottage empty for fall and winter. Their home, like mine, is taken over by furry people. It is fall, and the summer visitors are getting ready to leave the cottage by the lake. They put the canoe away, cover the furniture with sheets, pack up their things, and drive away with their bikes on the roof of their car. As soon as they disappear over the crest of the hill, the bear family comes down to the cottage. They find the jar of honey that was left behind, take the sheets off the furniture, and they are warm and snug indoors when the first snow flies. Father bear takes one of his cubs ice fishing, and Mama bear and the other little cub stay home and bake a cake. Then many of the forest animals come over for a New Year’s party. Together they dance the night away, play games, and then they go to sleep. Readers who met the bear family in The Summer Visitors, will love this new story about a family of bears who enjoy the amenities that their human neighbors unknowingly provide. With only a few words in the whole book, this title will charm bear lovers of all ages, and it will make them wonder if the humans in the story ever really figure out what is going on behind their backs. A lot of people take trees for granted. They don't appreciate the many things that trees do for us humans, and for the planet as a whole. They certainly don't consider that trees are to be loved and treasured. In today's picture book, you will meet a little girl who loves one particular tree. It is not a grand redwood or a perfectly perfect nursery raised flowering pear tree. Instead, it is a wild tree, a tree many people consider to be a nuisance. 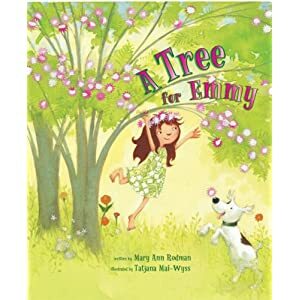 Emmy does not have a mimosa tree growing in her yard at home, and when her birthday comes around, she tells her parents that she wants a mimosa tree of her very own to care for. Emmy’s mother and father don’t think that this is a strange request. Instead, they go to the garden stores to find a mimosa tree. Unfortunately, most people don’t seem to appreciate mimosa trees. They “grow wild” and therefore are not sold in stores. Emmy thinks that this is very unfair. Why don’t the stores sell mimosa trees? Even if they are wild, they are still beautiful. Emmy doesn’t want something else for her birthday, so she has to make do with spending time with Gramma’s tree. As she lies under the tree, trying to “keep in the tears,” Emmy makes an amazing discovery. Young readers are going to going enjoy spending time with Emmy, who is very determined to get exactly what she wants for her birthday. They will appreciate the fact that this little girl is not afraid to be different, and that she refuses to let go of her dream. With a charming message and lovely multimedia illustrations, this picture book is a tribute to all those people, young and old, who love all of nature’s gifts and who have the courage to be unique. For some people being cool is one of those things that becomes very important. They want to impress the people around them, sometimes they even want to intimidate them so that they can feel big and strong. In today's picture book you will meet just such a character, a monster who wants to appear tough and scary, but who learns that honesty and friendship are more important than having an imagine that is false and worthless. There once was a monster who was determined that everyone should know that he was “the scariest monster in the world.” With his “wild and weird” fur, his giant club, his green teeth, and his ferocious manner, the monster really was scary, and he enjoyed frightening the animals in the forest. Then one day the monster developed a problem. He got the hiccups, and he could not get them to go away. He did everything he could, but nothing he tried got rid of the hiccups and so, feeling utterly miserable – and very hiccupy – he sat down on the ground and began to cry. Though the monster had scared them countless times, the animals in the forest felt sorry for him, and they did their best to help him. They suggested that he drink water while he was the “wrong side up,” and that he hold his breath for as long as possible. Unfortunately neither of these tricks worked. There was only one thing left to do. The animals were going to have to scare the monster’s hiccups away, but how do you scare a monster? In this delightful picture book, children will meet a monster whose loud voice and stomping feet cover up the fact that he is not really that bad a fellow. In fact, when he is not worrying about having an image, he is quite pleasant to be around. With its meaningful message about friendship, and its delightfully expressive illustrations, this is a picture book that children are sure to enjoy. Many children are fascinated by animals. They like to know what the biggest animal is, the smallest, the tallest, the fattest, the oldest. The are intrigued to find out about their lives and how they are adapted to their environments. In today's poetry title, children can read about a wide variety of animals, each one of which has a unique home. The author uses many different poetry forms to take children to the desert, grasslands, and other habitats around the world, so that they can meet some of the animals that live in these places. Animals live in all kinds of habitats, and they build or use a wide variety of homes. Some of them dig burrows, built nests, or scrape out a place to rest under a rock or log. Others, like snails and tortoises, carry their homes, their refuges, with them wherever they go. In this special collection of poems, Susan Blackaby explores five habitats, looking at some of the animals that live in these environments. She tells us about their habits, and about the homes that they create for themselves. On grasslands, you might find hares who, unlike their rabbit relatives, have no interest in digging burrows and living in crowded and noisy warrens. Instead, hares live in “hare-sized bowls” in pairs or alone, where they can find some peace and quiet. In wetlands, ducks take great care to choose just the right “marshy place” where they can raise their ducklings. They need to be near water, but they also have to look out for snapping turtles who like to snack on ducklings given half a chance. In this unique book, the author uses a variety of poetry forms to explore the homes and habitats of animals. There are poems that rhyme, and those that are written in blank verse. There is even one poem that is punctuated by animal sounds. At the back of the book, the author provides her readers with further information about habitats, and she also tells us about the poetry forms she uses, and why she chose to use them as she did. When my daughter was young, she was convinced that "nasty things" lived in her closet, and we had to make sure that the doors of her closet were shut tight before she would let us turn off her light at bedtime. Many children are persecuted by the monsters, bears, wolves, dragons and other creatures that inhabit the dark places in their homes, and it is hard to reassure them that these creatures are not out to get them. In today's picture book Joanna Harrison tells the story of a little girl who has a problem with a bear, and we see how her fear changes over time into something altogether different. Katie follows her mother’s advice, and to her amazement, the bear writes her a letter telling her that he has decided to go away, as per her request. Apparently, the bear needs a vacation. A few days later, Katie finds a package in front of the closet door. Inside the package is a snow globe. The bear has brought Katie a gift. Naturally, Katie sends the bear a thank you letter, but when she does not hear anything from the bear for several days she starts to worry. Is the bear ill? Is something terribly wrong with him? Many children are afraid of the bears, dragons, and monsters that inhabit closets, basements, and other dark and creepy places. When they are in bed, they are afraid to put their feet down on the floor in case something grabs them by the ankles. In this picture book, Joanna Harrison tackles this very delicate issue with sensitivity and gentle humor. Children will come to see that perhaps the creature they fear is not all that bad. Perhaps it is even lonely. Being able to see both sides of a story is a useful tool to have, and this book helps children to see that when they are afraid or unsure, they should try to look at their problem from a different angle. They may be surprised by what they see when they do. People often like to talk about how they were not able to become a dancer, singer, or stand-up comedian because things simply did not work out in their favor. Often this is true, the pieces of the puzzle did not come together at the right time. Sometimes though, these people's dreams did not come true because they doubted themselves. They did not believe that they could pull it off, so they did not put all their resources into the effort. Today's picture book is about a little mouse who doubts herself, but who does not give up. Mimi the Mouse wants to be a performer. She wants to sing, to dance, and to act on a stage. Unfortunately, Mimi does not think that she is “talented and beautiful” and everyone knows that performers have to talented and beautiful. Mimi goes and talks to Albert the Mole about her problem. He recommends that Mimi can learn how to sing and dance, so Mimi goes to dance lessons with Misha the Frog, and to singing lessons with Bubbles the Blackbird. Both of her teachers recommend that Mimi should not worry about any mistakes she makes. She should be herself and keep going. When Mimi learns that there is going to be an audition for the Mouse Ballet, she is ecstatic. Now at last she can show off what she has learned. This is “her big chance” to see her dream come true. Or is it? Many of us have dreams of becoming a great performer, scientist, or artist, but we doubt ourselves. We dare not believe that we can reach such heights. In this meaningful and heartwarming story, readers will meet a little mouse who has determination, and who is willing to work hard to make her dream come true. As they follow her story, readers will see that there is one more thing Mimi needs to have - confidence in herself and in her ability to follow through. With a meaningful message and a likeable main character, this is a book that offers support and encouragement to any child who has big dreams. I love reviewing books that encourage adults to talk to their children about the book that they are reading. Today's book has a philosophical bent, and it puts forward ideas that children will enjoy discussing with each other, and with their adults. The book gives readers a gift that extends beyond its pages, one that they can think about and enjoy as they go about their day. Seeing the first star in the sky is an indication that night is on its way. The one star is soon joined by other stars, and their presence makes the night feel less dark and frightening. It would be grand if you could collect a star or two, but as you know, this just isn’t possible. There are other stars that you can collect and treasure though. You can draw a star on some gold or silver paper, cut it out, and then put it in your pocket. It will be there whenever you need it, for example if you want to be a sheriff, or if you need a magic wand. If you have two stars, you can give one away, which could really help someone if they “don’t feel shiny” on that particular day. The good news is that if you ever lose your star, there are many stars in the world around you to comfort you. There are little green stars in moss, and strawberry flowers are star-shaped, as are the yellow flowers on pumpkin vines. Don’t forget that snowflakes are full of stars too. Look around and you will see these stars and many more, and don’t forget that every night, stars are there to delight you, even when you can’t see them. In this delightful book, Mary Lyn Ray’s lyrical text is beautifully paired with Marla Frazee’s memorable illustrations. 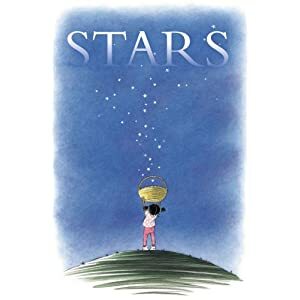 Young readers will be tickled by the thought provoking ideas that flow off the pages, and they will enjoy thinking and talking about the stars in their lives. I know that some might accuse me of being biased here, but I really do think that mothers are not properly understood (or appreciated thank you very much). I assure you that I am not saying this as a mother, but as an observer. There are all these books out there about how to be a better parent, but there are none about how to be a child who understands how to care for a mother. Thankfully, Doreen Cronin has seen this deficiency, and she has done something about it. As everyone knows, mothers are “the most advanced human models on the planet.” However, their incredible ability to do so many things so well does not mean that they don’t need care. It is important that everyone should know what kind of “necessary maintenance and care” mothers need “for optimal performance.” This is a manual to teach you how to do this. The manual begins by giving readers an important “Historical Overview” of moms. We must not forget that moms have been around a very long time, and that they need to be treated with due respect. The text then goes on to explain that a well-maintained and well-rested mom is a very rare thing to see. Mostly moms show the signs of “ordinary wear and tear.” You must be vigilant and make sure that your mom’s condition does not deteriorate. Of course, it is easy to say this, but how is it to be done? Fear not, because this manual will explain what a mom needs for her daily care and maintenance. Sleep and proper nutrition are vital, as is regular exercise, and a source of fresh water. It is also recommended that all moms should have regular grooming sessions. Just in case you encounter a problem with your mom, there is a troubleshooting section in this manual that might be of use to you. Though moms are “the most adaptable human models on the planet,” they do occasionally malfunction, and it is important that you know what to do should this happen. This is one of those rare books that will resonate with parents (particularly mothers) as much as it will with children. It is laugh-out-loud funny, and the manual style presentation and language is priceless. Wonderful illustrations and tongue-in-cheek humor throughout the book make this a title that is truly memorable. If you haven't had the privilege of having in a cat in your life, you have no idea how much mess and chaos a cat can create in a very short period of time. Cats get into places that seem safe, and before you know it a precious vase is smashed, a stack of books in tipped over, and a cake (inside a cabinet) has holes nibbled in it. 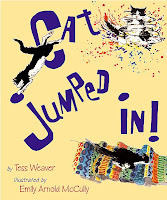 Today's picture book is about a cat who gets into a house, goes exploring, and leaves a trail of destruction in his wake. It is a warm summer day, and someone has left the kitchen window open. Cat jumps in through the window and begins to explore the kitchen. He walks across the rolled out pie dough and drinks some cream. Somewhere in that kitchen there is something fishy and Cat tries to find it. Finally, after much searching, he finds the source of the smell in the garbage can. Someone comes into the kitchen and she sees the mess. She sees Cat, who streaks out of the kitchen and hides in a closet. In the closet, Cat finds warm coats to rub himself against, and he plays with a scarf that has a tantalizing fringe. Then cat sees a hat on a shelf, and the feathers decorating the hat are just too hard to resist. Cat jumps up…and the shelf comes tumbling down with a loud cracking noise. The lady comes to see what is going o,n and she sees the cat. “Cat? Out!” she says. Young readers are sure to enjoy seeing how the cat in this story leaves a trail of chaos behind him. Everywhere he goes, his curiosity gets the better of him and he does something that he shouldn’t. With a text that is punctuated by shouts and sound words like “Woosh!” and “Thwump,” this is a picture book that children will enjoy. After all, children know all about getting into trouble…and getting out of it. Every so often, when I am driving around running errands, I see a dog trotting down the sidewalk, and it is looking thin, filthy, and desperate. Whenever I can, I will pick the dog up and take it to the animal shelter, hoping that it has simply lost its way and that its family will soon come to pick it up. All too often the dog goes unclaimed. For some reason, the dog's family does not care about it anymore. In today's picture book you will meet a dog who is abandoned, but who never gives up trying to find a new home and a new person to love her. One day Tupelo’s owners drop her off on the side of the road and drive off. All Tupelo has is her toy, Mr. Bones, but she does not give up. “Everyone belongs somewhere” she resolutely says, and she goes off to find out where her place is. Tupelo finds lots of wonderful places, but none of them have room for “a scrappy dog.” Then her nose leads her to a place where a group of dogs, the BONEHEADS (the Benevolent Order of Nature’s Exalted Hounds Ernest and Doggedly Sublime) are gathering for a special ceremony. The dogs explain that they are going to make a wish on Sirius, the Dog Star, and in return they will bury a bone as an “offering.” The other dogs all offer up their wishes to Sirius, but Tupelo has no bone to bury, so she cannot make a wish. Not knowing what else to do, Tupelo decides to follow the pack. The dogs are fed by a hobo called Garbage Pail Tex, and then all of them, including Tupelo, get onto a train. When they get to Hoboken, Tex and his hobo pals set about finding homes for all the dogs. Many are just lost, and their owners are delighted to see them again. Others truly are homeless, but there are people who are happy to invite the dogs into their homes and lives. Eventually Tupelo is the only dog left, and no one seems to want her. She is all alone again without the BONEHEADS, and without Tex. In this delightful picture book, readers will meet a dog whose owners abandon her. They will also meet a charming pack of dogs and learn about several of the world’s most famous dog characters including the fictional Toto and the real life Balto. We can tell how Tupelo feels as she tries to find a home of her own, and we can appreciate the fact that Tupelo, like all dogs, needs someone to love and care for her. Throughout the book, the charming text is perfectly paired with Melissa Sweet’s unique multimedia illustrations. When I was growing up, everyone would don a little felt poppy to wear on November 11th. 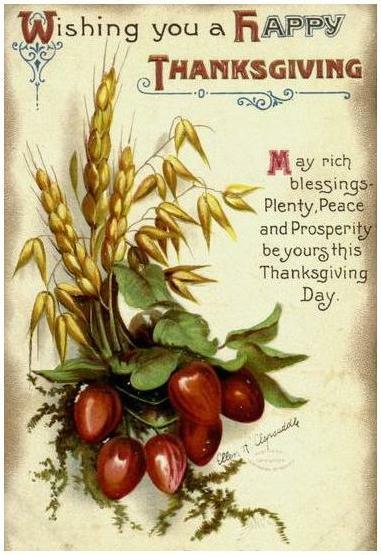 We called this day Remembrance Day, though some people still called it Armistice Day. On this day in 1918, The Great War ended after four terrible years. A generation of young men was practically wiped out, and many of the survivors came home from the war horrible damaged in mind or body. In school we learned a poem that still brings me to tears every time I read it. Here in the United States this day is called Veteran's Day, and it is a day when we honor all our soldiers who have served, and who have fallen. I have reviewed two books about Armistice Day/Remembrance Day/Veteran's Day that you might like to share with your child or children. There are also the titles in the World War I feature that will help children to understand what that conflict was about, and what it was like to live through it. For me, lists are tools that save me from forgetting to do all the things that I have to do. Were it not for lists, my life would be in a perpetual state of chaos. It has never occurred to me that lists can actually be creative things, even beautiful ones; that lists can be turned into poems that are a joy to read. When you read today's poetry title, you will see for yourself that lists really can be turned into wonderful poems. I hope you enjoy the poems in this book as much as I did. For many of us, lists help us to keep our busy lives organized. Without a list we don’t remember what to buy at the grocery store, or who to invite to a party. Typically, lists are not creative things, but poets have been using the list format for a long time to explore their fondness for words in new ways. For this collection, some wonderful poets (including Jane Yolen and J. Patrick Lewis) have written thirty-two list poems that show to great effect “the wide variety of the list form.” The poems are presented in such as way that they give the reader a picture of the school year. Then there are all the things that are “On the menu for school today,” a list of school doings that will surely be familiar to many. Here are the planets that need to be labeled, the bells that need to be shaken, and seeds that need to be planted, and the words that need to be spelled. Later still we find a list of all the places where one can read a book, and what a list it is too! It may seem ridiculously long at first, but as you read, you come to appreciate that every single one of these places is a perfect book reading place. Don’t forget that school days would not be complete without a visit to the box where all the lost and found items are kept. Here you will find the things that someone somewhere “misses,” those little things that somehow get forgotten for a while. Here is the “poodle pin,” “a pair of gloves,” and even “One yellow boot.” Where is the other boot we wonder. This delightful collection of poems will forever change the readers’ opinion of lists. It is true that shopping lists are usually boring, but clearly poem lists are quite the opposite. Young (and not so young) readers might even inspired to try writing a list poem of their own. If they do, there is a good chance that they will be surprised by the journey that they take as they play with words, mixing them up, saying them out aloud, and trying them out for size.